Buhari Repents? Says "I Won’t Ignore Any Part Of Nigeria"
Looks like Nigerians won't be hearing about 5% and 93% dichotomy again. President Muhammadu Buhari on Tuesday in Abuja promised that no part of Nigeria will be ignored under his watch. 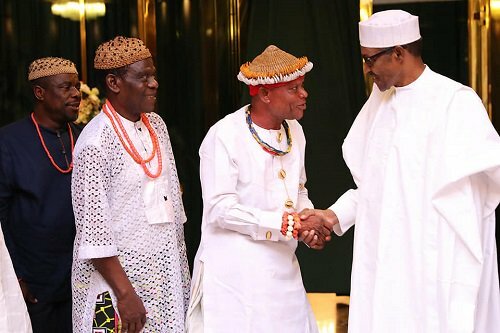 He gave the assurance when he received a delegation of Ugep Kingdom, Cross River State, led by His Royal Highness, Obol Ofem Ubana, Obol Lopon of Ugep, a retired Army officer. The President, in a statement by the Special Adviser on Media and publicity, Femi Adesina, was responding to a request by the royal father for the Federal Government to intervene and resolve inter-ethnic conflicts, affecting several communities namely Nko, Nyima, Oyadama, Edibe, Usumtong, Adadama and Ekureku. Buhari told the delegation: ‘‘I assure you that under my watch, no part of Nigeria will be ignored. "I am very pleased that you [the traditional ruler] have shared some professional background as a former military officer. Buhari has been widely criticised for appointing cronies over others.